What is Hong Kong noodles? Is that Yee Mee? Looks like Yee Mee to me. Is that a typical egg noodle from HK? I love seeing Hong Kong being mentioned anyway. I am homesick now seeing your lovely noodles. Instead of using cold water to wash off the noodle, use hot water and boil it for 1 to 2 mins may help to reduce the clump up problem. By the way, I really like your recipe. I luv noodles. Your noodles were stir-fried beautifully. Better than the Chinese restaurant. Guess it must be a lot of "Wok He" when it is just cooked from the pan. Yummy! Any noodle is a good noodle to me. It was weird though, growing up, I don't really like any yellow noodle. It make my head spin. But now, I just could not get enough of it. Your Hong Kong noodle look delicious! Yummy! Yeah, Gert, what is Hong Kong noodles? Is it fresh egg noodles? Cat, I already put a pix of it here. This noodles is more likie wanton mee. Discoverlane, thanks you and thanks for the tips. Will do that the next time. Zue, this noodles taste better than the regular yellow noodles. Gert,your mee look delicious! usually I bought alots of noodles from Chinatown but at the end tong sampah it's goes...forget to cook..It's weird ,I wonder why they called Hong Kong noodles too..maybe just a fancy name..
Oh, what can I say, I can't stand to have noodle in front of me. I have to eat all of them ^ ^. Wah, that looks good. 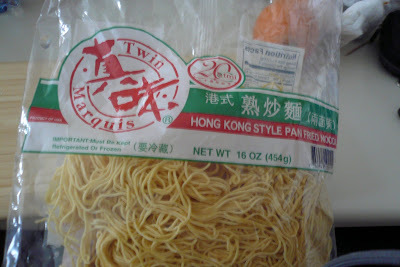 Next time i go to the asian supermarket, i will look for mee hong kong. Lesley, yea fresh noodles don't keep too long that is why I will buy enough just for two weeks. Farina, mee ni memang sedap. Give it a try. every complaint helps! :) thanks!